How Much Does it Cost to Live and Work in the UK? Did you ever stop to think about how much having a job actually costs you? Here’s a clue: It ain’t cheap. Think about how much you spend on your train tickets or petrol, how much you fork out for your daily lattes and those overpriced lunches at the organic cafe round the corner from the office. 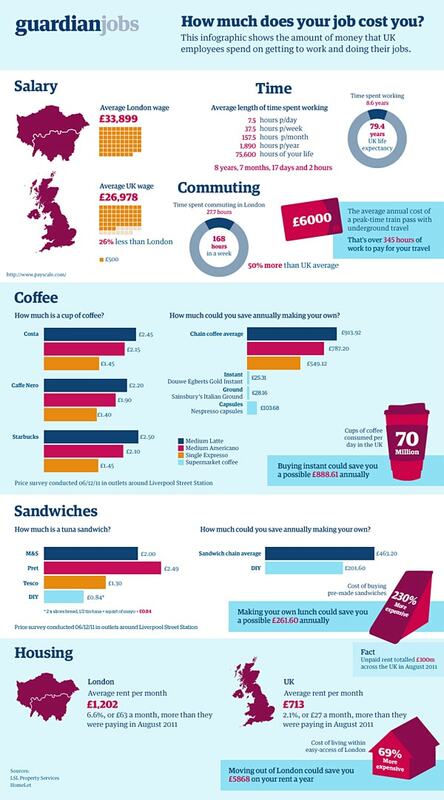 Before you get your spreadsheets out, have a look at this infographic compiled by Guardian Jobs on the price of living and working in the UK. RELATED: How the UK Economy Affects Jobseekers and Recruiters. Brought to you by Guardian Jobs.